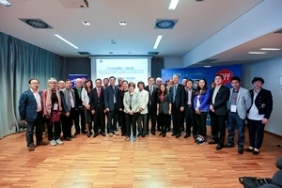 The overseas promotion conference of CIFF Guangzhou and Shanghai took place on April 15th, 2015 at NH Hotel facing the FieraMilano fairgrounds, during Salone del Mobile, with the participation of keynote representatives of the Chinese and Italian furniture industry, Chinese furniture associations, public and private institutions, trade operators and press. In his opening speech, Mr Li De Ying, General Manager of China Foreign Trade Guangzhou Exhibion General Corp, outlined the role of China as the world’s second largest economy, and presented the points of strength of the new edition of CIFF to take place for the first time this year at Hongqiao, Shanghai, from 8 to 12 September 2015. According to Mr. Li, last year China’s GDP totalled 10.4 trillion USD, up by 7.4%. The 770 billion USD increase of GDP is equal to a medium size economy. According to IMF, China’s GDP growth in 2014 contributed to 30% of the world’s economic growth. According to the Chinese government statistics, China produces 25% of the world’s furniture, making it the largest furniture producer around the globe. It is anticipated that the total output value of China’s furniture sector in 2015 will reach 400 billion USD. A large economy contains a large market. A large industry generates large exhibitions. In the era full of opportunities, CIFF raised a brand new strategic concept: starting from 2015, CIFF September session will transfer to National Exhibition and Convention Centre in Shanghai. In the future, CIFF will be held in Pazhou, Guangzhou in March and in Hongqiao, Shanghai in September, creating a completely new layout with fantastic furniture fair in two mega cities. CIFF was established in 1998 and has been successfully held for 35 sessions. As the world’s biggest furniture fair, the scale of CIFF this year will total 1.08 million sqm. With a large number of exhibitors and trade visitors, a great variety of products and high exhibition quality. Mr. Li concluded: “As an old Chinese saying goes, to make things happen, what we need most is the right timing, the right place and the right people. As China is now under economic reform, we are at a golden period of opportunities. That is the right timing. As we will launch our show in the brand new exhibition centre, we are embracing the right place. With attention and support by professional media around the world, and with concerted efforts by our team members, that is to say the right people, CIFF Shanghai will no doubt make a great performance this September”. A full agenda of speakers included Ms. Sara Colautti, senior partner CSIL, Centre for Industrial Studies, who presented the furniture market outlook for China, focusing on opportunities for companies. which are doing business on that market, with forecasted consumption of furniture and rate of growth for local economy in Shanghai. With its 23.9 million of inhabitants, Shanghai is China's most populous city. Since 1993, the city has been facing a negative natural growth rate because of low fertility rate. Migrants have made up the largest percentage of city's population growth. By 2020, the population is expected to further grow (+29%) along with other Chinese cities. The number of households is projected to increase by 27%, thus reaching nearly 10 million. By 2020, the city will face an increase of 108% in the households' consumption by exceeding US$ 138 million. This growth will be driven by an overall increasing of disposal income as well as by an increasing of consumption of households with high income: they will generate a consumption of US$ 12.2 billion compared to US$ 2.2 billion in 2012. It is worth noting that Shanghai is the largest consumer market among all mainland cities, supported by the rising income level and large inflow of tourists. Shanghai consumers are also being viewed as trend-setters for fashion and lifestyle products among the whole country.